AFRICANGLOBE – We must move forward, striking out tirelessly against imperialism. From all over the world we have to learn lessons which events afford. Lumumba’s murder should be a lesson for all of us”. — Che Guevara, 1964. “Dead, living, free, or in prison on the orders of the colonialists, it is not I who counts. It is the Congo, it is our people for whom independence has been transformed into a cage where we are regarded from the outside…” — Patrice Lumumba, October 1960. 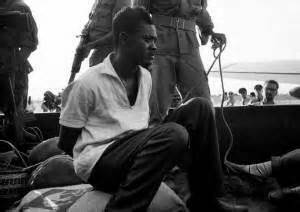 The truth surrounding the brutal murder of Patrice Lumumba is an embarrassing event which, when exposed to the African youth of today, will definitely send the US government scratching its head. The Democratic Republic of Congo (DRC) has had a troubled history since the assassination of Patrice Lumumba. Currently there is conflict in the eastern DRC. But who are the main actors in the conflict this time? African leaders, it is important to remember history so that you can appreciate what is going on today in Africa and the rest of the world. You who have fought for independence, and are today victorious, I salute you in the name of the Congolese government. We have been subjected to insults and sarcasms, to the blows we had to endure from morning to night just because we were Africans. We learnt that the law was never the same according to whether it was applied to Whites or Blacks. Who will ever forget the shootings or the barbarous jail cells awaiting those who refused to submit to this regime of injustice, oppression and intimidation? With this speech, it was said that he signed his death warrant. From the very first day, the West especially the American and the Belgian governments started to sabotage Lumumba’s government and sought the immediate removal of Lumumba at all cost. Ludo De Witte, the Belgian author of the best book on this crime, qualifies it as “the most important assassination of the 20th century“. His assassination’s historical importance lies in a multitude of factors, the most pertinent being the global context in which it took place, its impact on Congolese politics since then and Lumumba’s overall legacy as a nationalist leader, writes Georges Nzongola-Ntalaja, a professor of African and Afro-American studies at the University of North Carolina, author of “The Congo from Leopold to Kabila: A People’s History”. Today, it is impossible to touch down at the (far from modernized) airport of Lubumbashi in the south of the DR Congo without a shiver of recollection of the haunting photographs, taken of Lumumba there shortly before his assassination, and after beatings, torture and a long, long flight in custody across the vast country which he so loved. — Victoria Brittain, The Guardian, 2011. It is a fact that both the Belgian government and the United States actively sought to have him eliminated. The CIA ordered his assassination but could not complete the job. Instead, the United States and Belgium covertly funnelled cash and aid to rival politicians (just as they recently did in Libya) who seized power and arrested Lumumba. U.S. President Dwight D. Eisenhower had said something [to CIA chief Allen Dulles] to the effect that “Lumumba should be eliminated”. This was revealed by a declassified interview with then-US National Security Council minute keeper, Robert Johnson which was released in August 2000 from Senate intelligence committee’s inquiry on covert action. The committee later claimed that while the CIA had conspired to kill Lumumba, it was not directly involved in the actual murder. Therefore one must ask: on whose orders was the actual murder executed if not the United States? Which elements in the CIA ever faced justice for such a brutal murder? In his book, “In Search of Enemies: A CIA Story” John Stockwell (1978), revealed that a CIA officer in Elizabethville was in direct touch with Lumumba’s killers the night he was assassinated. Later, another CIA agent admitted to have had the body in the trunk of his car to try and get rid of it (p. 105) This leaked cable went on to state that Lumumba was first picked up from the airport by “all White guards“, taken to the bush where his fate was decided and his body completely dissolved in acid, leaving no traces whatsoever. What a horrible way to eliminate the traces of such a hero! “Somewhere in Katanga in the Congo- where and when we do not know- three of our brother freedom fighters have been done to death. They have been Patrice Lumumba, the Prime Minister of the Republic of the Congo, Maurice Mpolo, the Minister in his government who was elected from Katanga Province and Joseph Okito the Vice-President of the Congolese Senate. About their end many things are uncertain, but one fact is crystal clear. They have been killed because the United Nations, whom Patrice Lumumba himself as Prime Minister had invited to the Congo to preserve law and order, not only failed to maintain that law and order, but also denied to the lawful Government of the Congo, all other means of self-protection.” Kwame Nkrumah, (Challenge of the Congo, page 129). “History records many occasions when rulers of states have been assassinated. The murder of Patrice Lumumba and of his two colleagues, however, is unique in that it is the first time in history that the legal ruler of a country has been murdered with the open connivance of a world organisation (the United Nations) whom that ruler put his trust”, -Nkrumah concludes (page 129/130). It is my convit happened in Libya in 2011 goes to affirm the real agenda of the UN, so long as Africa is concerned. Just as it had always been, it is still the same for Africa. But who cares when an African leader is brutally murdered on the orders of Western agents? After all we are used to it. Between 1961 and 1973 alone, six African independence leaders were assassinated by their ex-colonial rulers, including Patrice Lumumba of the Congo. A recent report by a Belgian Commission revealed that Belgium wanted Lumumba arrested and was not particularly concerned with Lumumba’s physical well-being. Though informed of the danger to Lumumba’s life when later arrested, Belgium did not take any action to avert his death. Under its own laws, Belgium was legally culpable for failing to prevent the assassination of the leader of a country where it had colonial ties. It was also in breach of its obligation (under U.N. Resolution 290 of 1949) to refrain from acts or threats “aimed at impairing the freedom, independence or integrity of another state. In 2001, a Belgian Commission exposed that there had been previous U.S. and Belgian plots to kill Lumumba. Among them was a CIA-sponsored attempt to poison him, which might have come on orders from the then U.S. President Dwight D. Eisenhower. A CIA chemist Sidney Gottlieb was made to devise a poison disguised as toothpaste for the murder of Lumumba to which the corporate media intended to blame on “opposition elements”. This plot however backfired. In another book, “Congo Cables”, the author details many communications by local CIA Station Chief, Larry Devlin at the time who continually urged the total elimination of Lumumba as the only outcome the US government wanted to see (p. 53, 101, 129-133, 149-152, 158-159, 184-185, 195). Thanks to the power of suppression, political intimidation, as well as the fear and panic on the part of many African leaders who surrender at the expense of the African people. The bloody hand of colonialism, imperialism and neo-colonialism has always fought hard to burry the facts surrounding the brutal murder of many African heroes and tens of thousands of the people. The African people of today, continue to live under the illusion of so-called “independence, as foreign pressure continues to mount on their leaders to either comply or face similar fate. That notwithstanding, we the African generation of today, cannot sit aside and watch our history to be distorted nor completely buried for the sake of satisfying the wishes of the oppressor. Our revolutionary leader Patrice Lumumba has underlined that the history of the African people must be written. This history should not be the type that Brussels, Paris, Washington, the United Nations nor the corporate media will teach. Rather, Africa’s history should be written by the African people and should be taught in all the countries emancipated from colonialism and its current puppets… a history of glory and dignity. African scholars and all historians of African origin therefore owe our children, the youth and our children’s children, the responsibility to teach them the true history of their ancestors. The future generations have every right to know the sacrifices and the price which many of their ancestors had to pay (with their blood) before we were able to attain our political independence. It was Lumumba’s wish that “Africa writes her own history, a history of glory and dignity”. Lumumba and his kind we fall short of today, but we will get there. –A message to the African youth.He is a true African hero who must be celebrated by the African people all over the world. Previous articleOil in Congo – Threat to Stability or Development Opportunity?